Britain's oldest mother brought her baby home for the first time yesterday. 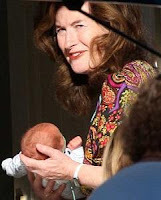 Elizabeth Adeney, 66, looked radiant as she lifted her son lovingly out of her car. She is reported to have named him Jolyon - which means 'young at heart'. They were discharged from Addenbrooke's Hospital in Cambridge yesterday afternoon and picked up by a female friend and another woman, believed to a nanny, in Mrs Adeney's car which was recently fitted with a child seat. The wealthy businesswoman smiled broadly as she gently carried her little boy, who appeared to have a tube coming from his nose, into her £600,000 detached house in the Suffolk hamlet of Lidgate. It was a moment she has dreamed of for most of her adult life.